Dennis School in Bishopville was built in 1936 and stood in stark contrast to its neighboring school built the same year, Bishopville High School. Constructed during the heart of segregation, Dennis was intended to serve as an elementary school for the town’s African American children, while Bishopville High School would house white high school students. Bishopville High School was built for $71,000, while Dennis School was built for $17,000. During this time county funding was widely disparate between black students and white students: white children were allotted $48.38 per student, while black children received only $5.68. The original Dennis High School, located three blocks from the new Dennis School, was a two-story wooden building that burned to the ground before the start of the 1936-1937 school year. Displaced, the high school students were forced to share the newly-built Dennis School with the area’s elementary students for the next 12 years. Dennis School then became known as Dennis High School. The school was significant in educating African American students in the area, as it was the only black high school in Lee County, which covers 411 square miles. As a result, many students walked long distances to Dennis High School or simply ceased their schooling after the eighth grade. During this time it was not unusual for black students of high school age to end their educations. In 1941, 19 South Carolina counties lacked high schools for black students, and only eight buses across the entire state provided black students with transportation. Due to segregation, attending high school was problematic at best and illegal at worst for a great number of South Carolina children. In 1948 a new high school for black students was built to relieve the overcrowding that plagued Dennis High School. The Dennis High School building then became Dennis Primary School. At this time, talks of desegregation were brewing, and segregationists were well aware of these discussions. When James Byrnes became governor in 1951, he enacted the “Education Revolution” to pour funds into African American schools, hoping to dispel any opinions that black schools were inferior so that students would remain segregated as part of the Separate But Equal laws that overshadowed our nation. Lee County did not integrate its schools until 1970. At that time Dennis High School, which had served black students of varying grades for over 30 years, ceased operation. Today the school building serves a the Dennis Community Center. For further information read Rebekah Debrasko’s 2008 study titled Equalization Schools in South Carolina, 1951-1959, available though the National Register. Dennis High School, constructed in 1936, is significant for its importance in the education of African-Americans in Bishopville and Lee County and for its representation of the inequalities of South Carolina’s “separate but equal” educational system. In addition, the renovation of Dennis High School in 1954 is an excellent example of the state’s efforts to change these perceptions during the “Brown vs. Board of Education” era. In 1936, two new schools were constructed in Bishopville. Bishopville High School was built for the white students at a cost of about $71,000 and was designed by noted architect Henry Dudley Harrall. Dennis High School was constructed by Edgeworth and McBride Contractors of Cheraw for Bishopville’s black students. It was built at a cost of $17,500 on land donated by local philanthropist Rebecca Dennis. The similarities between the design of the two schools suggest that Harrall had some hand in the design of Dennis High School also. The original Classical Revival style school building is an L-shaped, one-story, load-bearing red brick structure that rests on a masonry foundation. Recessed symmetrical wings flank the main block. A third wing, which gave the building its original L-shape, houses the auditorium. In 1954, a single classroom addition was built on the northern end of the rear elevation. Hi Sharon, we are so sorry to hear about your dad. Please let us know if there is ever anything you’d like us to add to our page. It sounds like you may know some valuable stories! My father was the AD at Dennis High School; his name was James Davis. He passed on August 5, 2018. What a beautiful story, and we couldn’t agree more. Thank you for sharing this! So often I have thought of the times I spent roaming the Lee County Library on the corner of Main with its Irish stone gate influence. I have also thought much of my parents’ memory of meeting their friends on the monument yard. Both Dennis and BHS bring similar memories for me. I am always [interested] when I meet students that left for Robert E. Lee to escape desegregation. Many of those graduates seem to have less education than those of us graduating in 1974. They certainly have gone no further in this life than those staying to make the public schools better, or just because their parents couldn’t afford to send them elsewhere. To people like the Lee County librarian who allowed me such enjoyment of books and never chased me away during my hours of just wandering and searching and all the teachers, even those who thought their kids were too good to go to school with Blacks, I say thank you! I also ask that we all stop and think about the benefits of helping others learn. It is a hard thing to think of sacrificing our children to education. But what if we had no choice but to give a little at home to help others less fortunate? I also wonder what life would be like for so many Blacks who have been deprived over the last century, had their education been thought to be as valuable as the education of Whites. There is much work to be done and it is not because Blacks are inferior. It is because they have been given much less to work with. Thank you so much for sharing, Angela! I attended both Dennis Primary (pictured above) and Dennis High School. Some of the best years and best education ever, the best educational foundation considering the county allocated monies of $5.68 per Black student versus the $48.38 per White student. I can remember and appreciate the Black teachers teaching us the importance of protecting our books from year to year. Those books came at a high cost. I still have a high respect for books and learning. was among the integration processes in 1970, and still I rise. Loved both schools for what they meant to me. 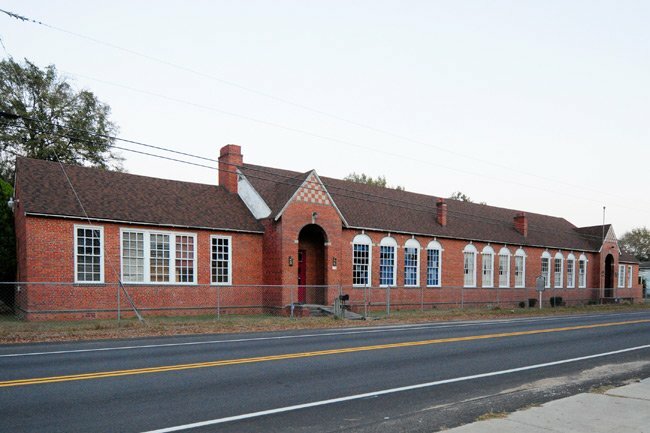 The building above was used until the mid -1960s as Dennis Primary with grades 1 and 2 even after the newly constructed Dennis Elementary and High School opened with grades 1 and 2 through 12 further down on (Railroad Avenue) Cedar Lane. Later it was used as a day care and Head Start Center. It is known now as the Dennis Community Center on Cedar Lane (the old Railroad Avenue.) The historical marker is located at this site. There was a newly built Dennis Elementary and High School in 1954 which was attached to an older building . It was also located about two blocks down from Dennis pictured above. I began first grade in 1954 in new building. Over the years after 1970, it has been used as Bishopville High, Dennis Intermediate and as of 2014 it housed grades 4 and 5 from Bishopville Primary on the Dennis Campus.This 2016-2017 school year the entire Bishopville Primary grades 4K- 5th grade is located at Dennis Campus. There was an addition to what was the side of the gymnasium in the 1980s and that became the front on Roland Street. The original front was on Railroad Ave which is named Cedar Lane now. The original football field of 1950s-1970 has been developed for community and named Dennis High Memorial Park. Parents during the 1950s raised funds to purchased cinder blocks and lumber to enclosed the field where football and baseball games were played as well as homecoming events. Dennis High School Wildcats lives on in the hearts of those who attended their faithful alma mater. Yes this school is there and standing beautifully. I attended this school and am very proud of it. I have never seen this school in Bishopville as many times I have been going there. I went to Dennis High School and graduated the year of 1965. A very good school.